In the farmdoc daily article of July 12, 2017, we calculated the likely size of the “gaps” in biofuels consumption created by the EPA implementation of the Renewable Fuels Standards (RFS) for the years 2014 through 2018. The conventional ethanol gap is the difference between the (implied) conventional mandate and ethanol consumption, whereas the advanced mandate gap is approximately equal to the difference between the total advanced mandate and biomass-based diesel mandate. In this article, we estimate the total annual supply of biomass-based diesel (BBD) and then compare that to the size of the estimated mandate gaps plus the BBD mandate for each year from 2014 through 2017. Given that BBD has been the “marginal gallon” for filling the gaps in the RFS in recent years, this will provide important information on the total production and consumption requirements for BBD. Estimating the annual supply of BDD is a bit more complicated than might be expected for several reasons. First, supply consists of both domestic production and net imports and those estimates naturally have adjustments and errors of various sorts. Second, supply consists of both biodiesel and renewable diesel (see the farmdoc daily article of December 13, 2013 for a discussion of the differences). Third, there are two alternative sources of BDD supply estimates. The Environmental Protection Agency (EPA) is responsible for implementation of the RFS and provides data on Renewable Identification Number (RIN) transactions and renewable fuel volume production from the EPA Moderated Transaction System (EMTS). The data in that system is reported by firms that generate RINs. The U.S. Energy Information Administration (EIA) also provides estimates of domestic BBD production and imports based on industry surveys as part of its monthly STEO reports. 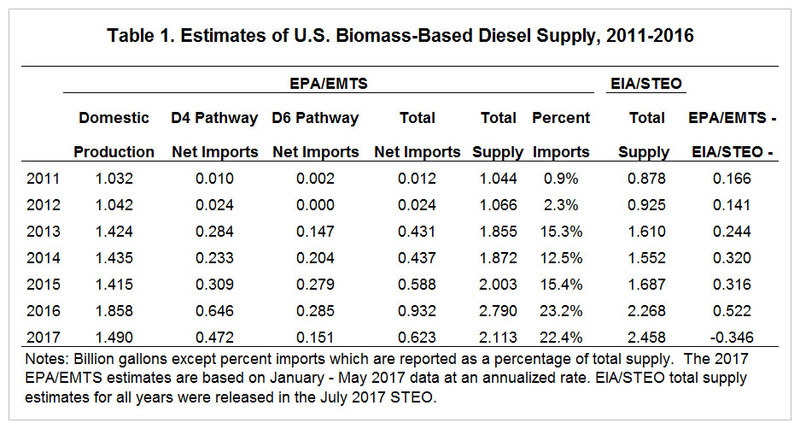 The estimates of BDD supply used in this analysis are based on EPA/EMTS data, but both the EPA and EIA supply estimates are presented in Table 1 for comparison. We focus on the EPA estimates because, at least in theory, the EMTS data should be a virtual census of domestic production and imports of BBD and the EMTS data allow imports of BBD to be broken out. Use of the EMTS data to estimate supplies does require some assumptions. First, the breakout of BBD production into domestic and import components is only reported in ethanol equivalents. This requires the use of a conversion factor to convert the BBD components from ethanol equivalents to “wet” physical gallons. The conversion factor for BBD we use is the average actual weighted-average D4 conversion factor in each year. It is 1.54 in 2014 and 1.53 in all other years. Second, a small number of RINs is retired each year due to errors. We allocate these BBD error retirements based on the relative proportions of total domestic BBD production and imports. The EPA/EMTS data shown in Table 1 indicate that domestic BDD production rose steadily from 1.032 billion gallons in 2011 to 1.858 billion gallons in 2016. Production through the first five months of 2017 proceeded at an annual rate of only 1.49 billion gallons, but that rate is subject to change as the year progresses. The spike in production in 2016 and the drop-off so far in 2017 is also likely related to accelerated production in 2016 to capture the blender tax credit before it expired at year-end (e.g., farmdoc daily, March 1, 2017). In order to account for all BBD imports using the EMTS data, two pathways for imports to the U.S. must be considered. The D4 pathway shown in Table 1 is the more straightforward, consisting of both biodiesel and renewable diesel reported in the D4 RINs category to EPA by RIN generators. Volumes for this pathway are reported in the EMTS system in ethanol equivalents and can be converted to physical volumes by applying the same conversion factors discussed above for domestic production. One additional adjustment is needed, however. RINs attached to BBD volumes that are exported must be retired. Fortunately, the annual compliance data available in the EMTS system reports these volumes for each year through 2016. After converting to physical volumes, these export retirements are subtracted from D4 pathway imports to arrive at net D4 imports. The D6 pathway shown in Table 1 is the less transparent of the two and likely consists of both biodiesel and renewable diesel production from feedstocks (e.g., palm oil) that are not approved by the EPA for generating D4 RINs. Some BBD facilities were previously approved and grandfathered under current regulations to generate D6 RINs from the unapproved D4 pathway feedstocks. BBD volumes that generate D6 RINs are broken out in the EMTS data. However, the public EMTS data does not indicate whether these volumes are produced domestically or imported. But, since the BBD D6 volumes also approximately equal the total imported D6 volumes in the EMTS it can be reasonably inferred that the BBD D6 volumes are all imported. No adjustment for exports in this pathway is considered. As shown in Table 1, both D4 and D6 pathway net BBD imports were very small or zero until 2013, when D4 net imports climbed to 284 million gallons and D6 imports reached 147 million gallons. Both continued to grow through 2016, with D4 pathway net imports surging to a high of 646 million gallons. Estimated total net imports of BDD from the two pathways increased from 12 million gallons in 2011 to 932 million gallons in 2016 and are proceeding at an annual rate of 623 million gallons in 2017. As with domestic production, the import spike in 2016 was likely related to the impending expiration of the blender tax credit. The total estimated supply of biodiesel (domestic production + total imports) increased from 1.044 billion gallons in 2011 to 2.79 billion gallons in 2016 and is proceeding at an annual rate of 2.113 gallons so far this year. Importantly, estimated total net imports as a percentage of total estimated supply has increased sharply, now accounting for nearly a quarter of total supply. It is interesting to observe that the estimates of total BDD supply provided by the EIA were considerably smaller than estimates based on EPA data. The magnitude of that difference has also been increasing, reaching 522 million gallons in 2016. The annualized rate of estimated supply based on EPA data so far this year, however is considerably smaller than the EIA projected supply. That difference may be another indication that supply as measured by EMTS data will accelerate in the last half of the year. There are two likely explanations for the difference between the two total supply estimates. First, the EIA excludes small production facilities from its domestic biodiesel production survey. Second, the EIA supply estimates exclude renewable diesel fuel co-processed with petroleum feed stocks. This means that some of the largest producers of imported renewable diesel (e.g., NESTE) are not included in EIA supply estimates. We can now proceed to the second part of the analysis–comparison of the total supply of BBD to the size of the estimated mandate gaps plus the BBD mandate. In rows 1 through 5 in Table 2, we present the estimates generated in the farmdoc daily article of July 17 for the mandate gaps, the BBD mandate, and the implied total BDD to meet both the RFS gaps and the BDD mandate for the years 2014 through 2018. 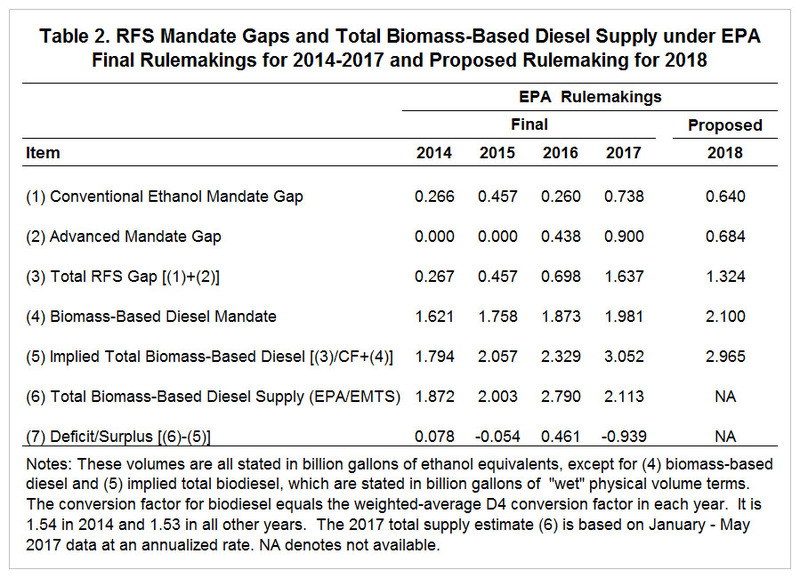 The magnitude of the gap for conventional ethanol is calculated as the difference between the EPA mandate as implemented (or expected to be implemented) and the actual or expected consumption of conventional ethanol. The advanced biofuels gap is calculated as the advanced mandate minus the cellulosic mandate, minus the biomass-based diesel mandate (multiplied by 1.54 in 2014 and 1.53 in all other years to convert wet gallons to ethanol equivalents), minus the actual/projected use of undifferentiated ethanol (Brazilian and domestic), minus the actual/projected use of undifferentiated non-ethanol biofuels. The gaps for 2014 through 2016 are calculated based on the final rulemaking and actual total gasoline and diesel consumption and biofuels volumes for those years. The estimated gaps for 2017 are calculated based on the final EPA rulemaking for 2017 and the projection of calendar year petroleum gasoline and diesel use found in the July 2017 EIA Short term Energy Outlook (STEO) report. The estimated gaps for 2018 are calculated based on the proposed EPA rulemaking and the projection of calendar year petroleum gasoline and diesel use found in the July 2017 STEO report. We then calculated the magnitude of biomass-based diesel that would be required to meet the biomass-based diesel mandate as well as fill the mandate gaps for both conventional ethanol and advanced biofuels. The estimates of total BDD supply from Table 1 are presented in row 6 of Table 2 and subtracted from row 5, resulting in an estimate of the magnitude of the deficit or surplus in BDD supply relative to the quantities required to fill the RFS mandate gap (row 7). These estimates show a small surplus in BDD supplies in 2014, a small deficit in 2015, and a large surplus in 2016. The large surplus in 2016 again makes sense in the context of an expiring biodiesel tax credit. In essence, part of the BBD needed to meet the RFS in 2017 was produced in 2016 when the $1 per gallon tax credit was in place. The pace of BDD supply so far in 2017 points to a large deficit this year. However, the pace of supply generation may accelerate seasonally during the last half of the year, and importantly, the surplus supply of last year is available this year. Because of the surplus in 2016, total BBD supply would only need to increase 478 million gallons in the second half of the year in order to fill the RFS gaps and the BBD mandate. The estimates of annual biomass-based diesel (BBD) supplies developed here suggest that supplies have been expanding rapidly enough to meet both the rising BBD mandate and the larger gaps created by the “push’ in the RFS mandates since 2014. As a result, the total RFS mandate has been met in recent years without a substantial drawdown in the RINs stocks built up before 2014. Whether this can continue in the future and at what cost will depend at least in part on imports. Net BBD imports have grown from an estimated 12 million gallons in 2011 to an estimated 932 million gallons in 2016 and now account for nearly one-quarter of the total BDD supply. While the source of BDD (domestic vs. imported) does not influence the total consumption of feedstocks, there could be important implications associated with changes in domestic biodiesel policy and/or WTO rulings that could dramatically reduce BDD imports, in effect making the U.S. a BDD island. Specifically, a change from a blender to a domestic producer tax credit (assuming the tax credit is reinstated) would essentially shut out imports of BDD from the U.S. Similarly, a World Trade Organization (WTO) finding of unfair BDD trade practices by Indonesia and Argentina would reduce or eliminate imports from two important sources. Increasing dependence on domestic BDD production could have important implications for the cost of producing BDD. We will examine that issue in an upcoming farmdoc daily article. Irwin, S. "The Profitability of Biodiesel Production in 2016." farmdoc daily (7):38, Department of Agricultural and Consumer Economics, University of Illinois at Urbana-Champaign, March 1, 2017. Irwin, S. "Estimating the Biomass-Based Diesel Supply Curve." farmdoc daily (3):237, Department of Agricultural and Consumer Economics, University of Illinois at Urbana-Champaign, December 13, 2013.